Knitting in the round isn’t nearly as complicated as it seems. The beginning is the trickiest part; once you’ve started, you only need to work RS (right side) rows, never WS (wrong side – as in, if you’re using stockinette stitch, you only need to knit, never purl). If you’re doing a larger project, like a hat or a sweater, you’ll use circular needles to knit in the round. (I like to use them for large projects that aren’t round also: when knitting a blanket, I like to spread my gazillion stitches out on a circular needle rather than trying to crowd them onto straight needles.) I’ll post a tutorial for using circular needles soon. 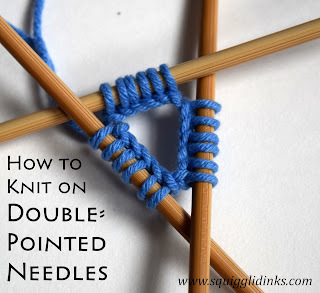 For smaller projects, though, like socks and mittens, some scarves, and baby hats, the best tool for the job may be double-pointed needles (dpn). These come in a set of four or five. (I have sets in just about all sizes, but these are my favorites –they’re the ones I used in this post.) When using dpn, your stitches are divided between three or four needles, leaving one needle empty. This empty needle is the one you’ll knit stitches onto (your right needle, unless you’re a lefty). Lay your needles flat, on a table or wherever you have space. Form them into a triangle (or a square, if you’re using five needles), with the first cast on stitch on the first needle next to the last cast on stitch on the last needle. WRONG: the stitches shouldn’t be twisted around the left needle. WRONG: the stitches are twisted at the left side of the picture between the two needles. This is less of a problem than the first picture, but it’s still not good. Lay your needles so that the first stitch on your first needle is on the left and the last stitch on the last needle is on the right. The working yarn is on the right. Bring your empty needle up through the first stitch on the first needle and knit it using the working yarn from the last needle. 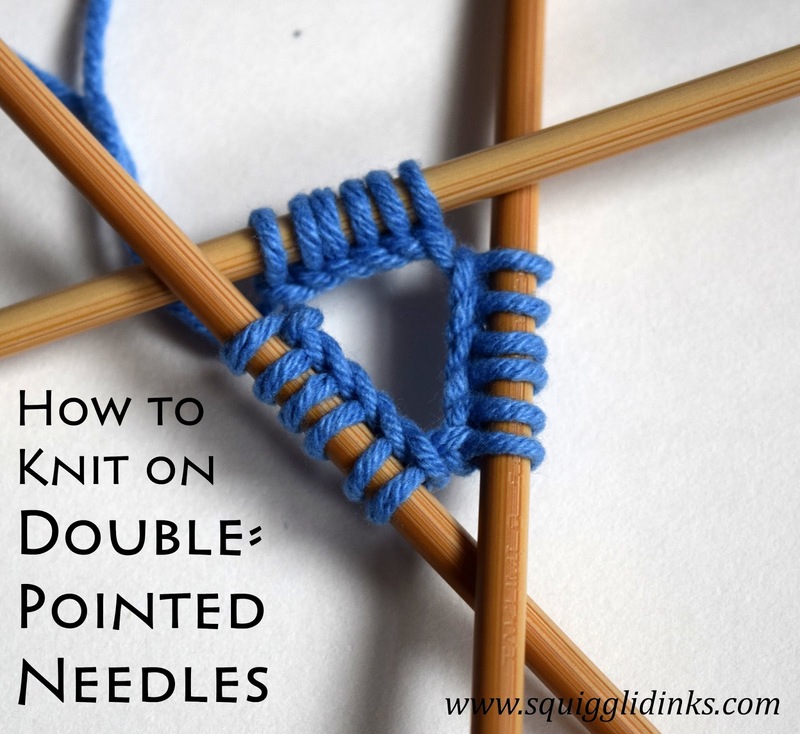 You’ll want to make sure you pull this stitch extra snug to close the gap between the needles. 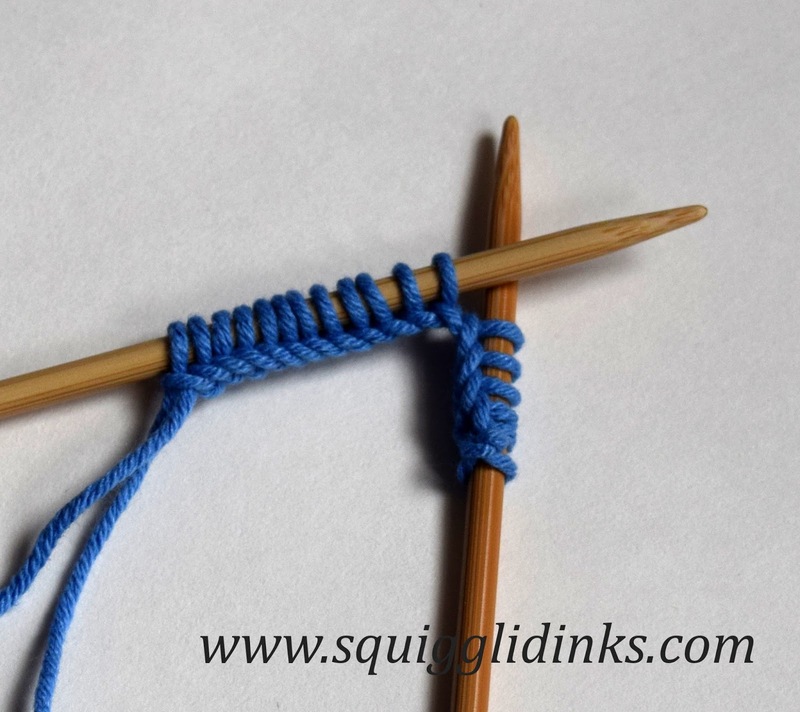 Keep knitting the stitches from that first needle onto your empty needle until your first needle is empty. 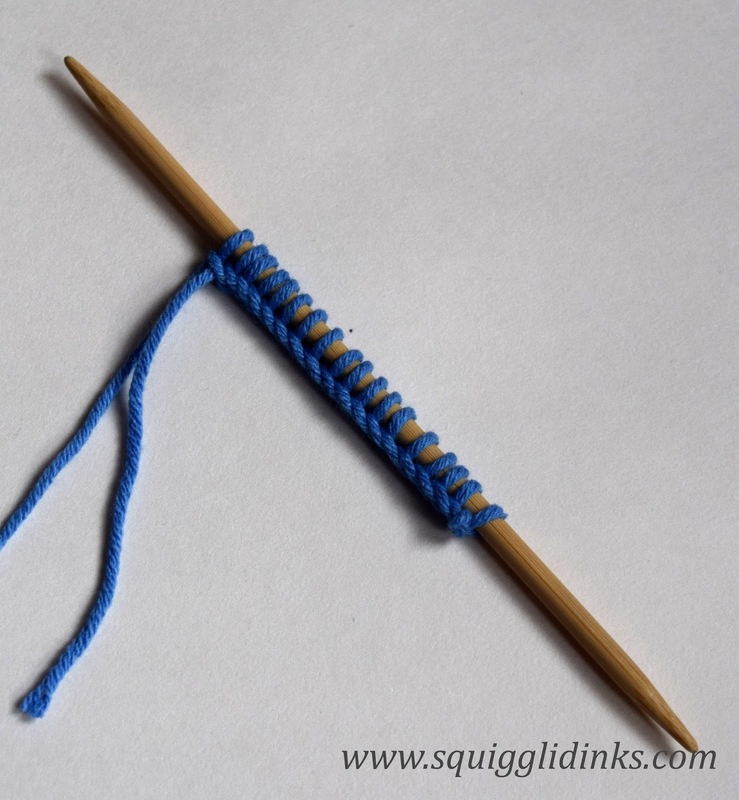 Rotate your needles until the working yarn is at the top and the second needle is on the left. The top right needle is the first needle that I knit; the second needle is now on the left. Using the newly empty needle, knit all the stitches from the second needle. What it looks like halfway through knitting the second needle. The first and second needles have now been knit (bottom and right); the third needle is on the left, and the working yarn is at the top. Turn your work so that the working yarn is at the top again. Knit the third needle. You have now knit one round on all three needles. There may be a bit of a gap between the last needle and the first needle (you can see the little loop at the top of the photo above, between the left and right needles). This is ok. The more you practice, the smaller and smaller that gap will be. Keep going, knitting one needle at a time and turning your work so that your empty needle is in your right hand, and the needle you’re knitting stitches from is in your left. It’s generally a good idea to place a stitch marker at the beginning of the round so that you know where one round ends and the next one starts. I will often just remember that the tail of yarn left from casting on is at the beginning of the round, rather than using a marker. Some stitch markers clip onto your yarn–you could clip one of those onto your work in the gap left at the beginning of the round. Other stitch markers are just loops that go over your needle and don’t actually attach to your yarn at all–with these, you’ll want to shift your needles a few stitches over by slipping stitches from one needle to another so that you have a couple of stitches on either side of your stitch marker (otherwise the marker will just fall off the needle and be useless). Now that you have the useful skill of knitting in the round, what projects are you going to try next?